Horopito is considered one of the oldest flowering plants – having remained unchanged for the last 65 million years. The powerful healing properties of Horopito were traditionally recognised as a natural remedy for skin and stomach upsets. In addition to traditional use, many years of rigorous scientific research has proven that Horopito has potent medicinal properties. Horopito is best known as a potent antifungal, especially against Candida albicans. In fact, Horopito is now recognised as the leading herb in the fight against Candida. As well as being a powerful antifungal, a breakthrough came when researchers at the University of Otago discovered that Horopito extract is very effective at killing the herpes virus. It was this discovery that started the journey to launch KOLSORE® to the world. How do we make Horopito extract? We farm Horopito at the top of New Zealand’s South Island. Surrounded by over a million acres of pristine National Park, our Horopito farm is truly unique – we are the only company in the world to farm Horopito. 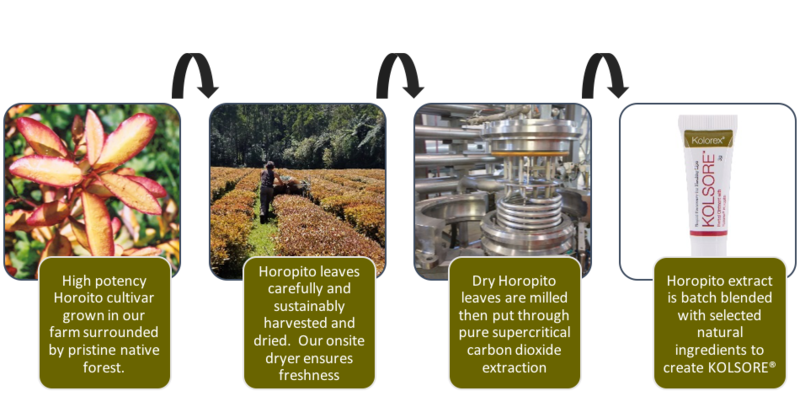 Our process from farm to extract involves carefully hand harvesting the Horopito leaves, drying them and coarse milling the leaf. We then put the dry leaf through supercritical carbon dioxide extraction to extract the actives from the leaf. This method of extraction uses no solvents or chemicals and leaves no residues, just pure, potent Horopito extract. Each batch of extract undergoes testing to ensure quality and potency. The bioactive compound in Horopito, called polygodial was first extracted from the Horopito plant in 1982. Our Horopito farm contains plants with the highest concentration of polygodial. Our research shows that our cultivar we use has up to 5x the strength of other Horopito cultivars.